Results from the War Within Event Series! The War Within has drawn to a close! Welcome back, Ashes players! With the War Within Event Series over, we’ve now taken the time to collect the votes and victories of Ashes players all over the world! As we mentioned in previous articles, the forces of Light and Dark in the world of Argaia were brought to bear against each other in the War Within Event Series. At the center of this conflict stood the enigmatic Phoenixborn named Sembali Grimtongue. Sembali is the Phoenixborn of Memoria, a city-sized maze of cathedrals and monasteries dedicated to the Gods of Argaia. For years Sembali has poured over the ancient holy tomes within Memoria’s walls, and it was deep within the darkened halls of the cloistered libraries that she discovered a secret that made her question all she knew about not only her fellow Phoenixborn, but the Gods themselves. 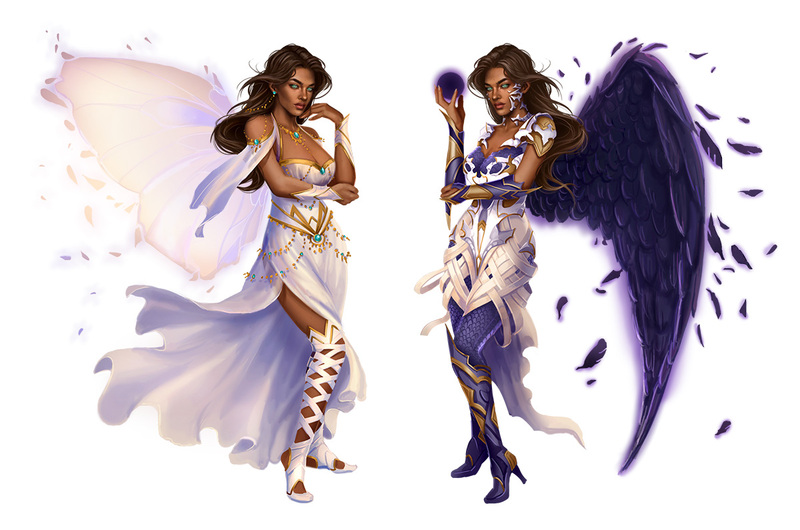 In the wake of this discovery, Sembali was forced to choose which path she would now follow: Would she continue to use her Phoenixborn abilities to safeguard the faithful of Argaia or would she instead embark on a path of conquest to take her rightful place as the Phoenixborn supreme? Starting in March of this year, we began sharing information about the War Within Event Series. Players were able to participate in tournaments across the world in order to help decide the fate of Sembali Grimtongue, an upcoming Phoenixborn. Each player that participated in an Ashes War Within event got to cast their vote for the path they wanted Sembali to choose, as well as receiving promo alternate-art allies as well! 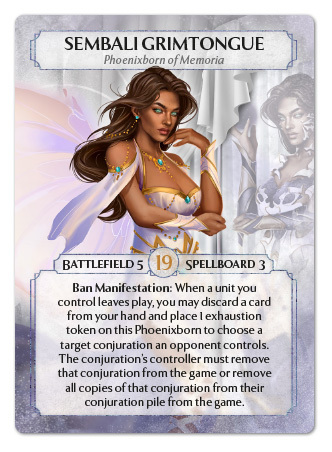 Sembali’s ability, Ban Manifestation is a very powerful answer to pervasive conjurations in Ashes, allowing players to permanently remove copies of conjurations from the game! This will definitely cause some major shakeups in Ashes strategy, and we’re very excited to see the new decks players make using the cards from Sembali’s upcooming expansion, The Fates of Memoria. Fans of Ashes might notice some new stylistic elements in the art of Sembali Grimtongue. This is due in part to an exciting new chapter for the world of Ashes. After creating the iconic images of Ashes: Rise of the Phoenixborn since its initial release, Fernanda Suarez has decided to pursue other projects and aspirations beyond illustrating for Ashes. We’ve been very lucky to work with Fernanda to craft and develop the world of Ashes, and her creative contribution to the game has been invaluable in crafting the critically-acclaimed look of our game, and we wish her the best of luck in her future endeavours. You can follow her work and support her here at her new Patreon site where she has posted her newest work as well as several video tutorials detailing her process. As we move on to this next chapter for Ashes, we’re very excited to announce that for The Fates of Memoria, we’ll be turning to Thander Lin, a very talented artist and illustrator! Thander’s style is a great fit for the world of Ashes, and we’re looking forward to developing more content for Ashes with an artist that can complement the distinct artistic style of the game. You can find more of Thander’s work here. That’s all for now, Ashes fans! Remember, the Masters of Gravity and the Path of Assassins are available now from retailers! The future is looking very bright for Ashes and we can’t wait to see where things go!